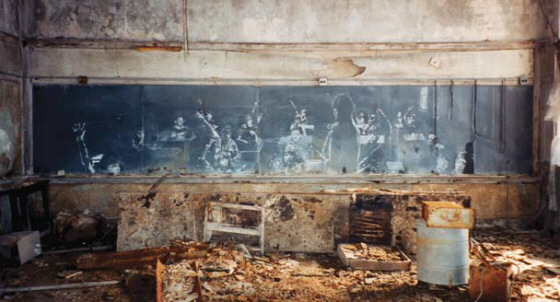 Tag Archive | "haunted schools"
Perhaps nothing tells more about a culture than its art. From paintings on cave walls carved by prehistoric tribes, representational art has evolved to chronicle historical events, fashion, religious and social mores, and political views. When written language emerged, artists signed their work with pride. They signed their paintings and chiseled their names onto sculptures to inform the world as to the originators of the creations. How, then, do we explain a large, chillingly realistic work created in our own time and left unsigned? 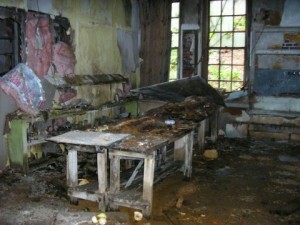 The work in question resides in a haunted and otherwise abandoned schoolhouse sitting atop a hill in Lambertville, New Jersey. 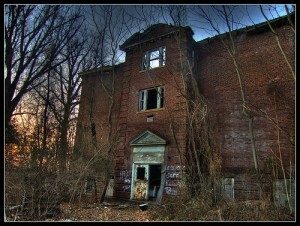 Erected in 1854, The Lambertville School closed its doors in the 1950s. Two decades later, a fire that destroyed part of the building was also rumored to have taken the lives of several children. Considering that classes had not been held in this decrepit structure for approximately twenty years prior to the blaze, the rumors are unsettling. And yet, they seem to have their basis in truth. A number of people who have summoned the nerve to explore as well as spend the night in the ramshackle building have published their tales of the strange goings-on within the school’s crumbling walls. These stories include hearing the horrific screams of children when no children were present, as well as heavy footsteps tromping up and down stairs and through corridors. One visitor described hearing a demonic, disembodied growl. These reports make me question the origin of the artwork found in a second floor classroom. 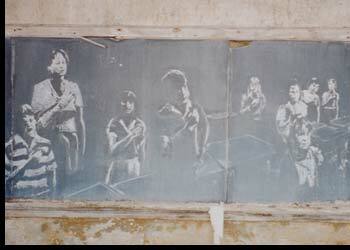 On the blackboards ringing three-quarters of the room are the images of children. Little ones are depicted giving the Pledge of Allegiance. Others stare bored into space, and one child is positioned like a corpse in its coffin. There is no joy in the children’s faces, none whatsoever. But what is most striking about this artwork is that the images were not chalked onto the boards or even painted on them: they are, in fact, etched permanently into the dark gray slate. Painstakingly crafted, they are also extremely realistic, making the blackboards genuine works of art. And yet, they stand unsigned. images be modern-day bas-reliefs, seared into stone by the energies of the dead in the moment that they departed this earth? And is this the reason the blackboards were never signed?